About six years ago, I spent a chunk of my very first salary on a portable music player, the iRiver H140, a relatively bulky and large hard-disk based player, with a capacity of 40G. Uniquely for music players before or since, the iRiver features both digital and analogue line ins and outs. It also has (more common) recording facilities and an FM tuner, the latter of which I used a great deal (and rules out just about all the iPods). This remarkable player has lasted nearly six years of moderate daily use. For the majority of that time, I've ran the rockbox open source firmware on the player, which has provided me with really wide codec support and excellent recording facilities. In the last month I finally had to replace the iRiver. I bought a Sansa Fuze player, featuring 8G of flash storage and a microsd expansion slot. 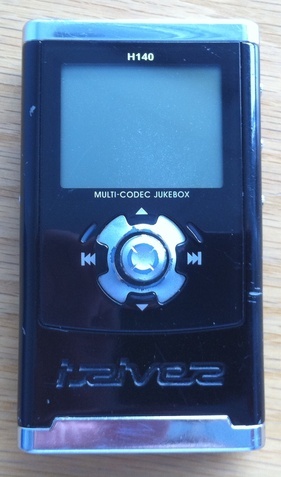 The Fuze is also capable of running rockbox. This year, 32G microsd cards have arrived. Adding one of those brings the capacity of the new player right back up to 40G. 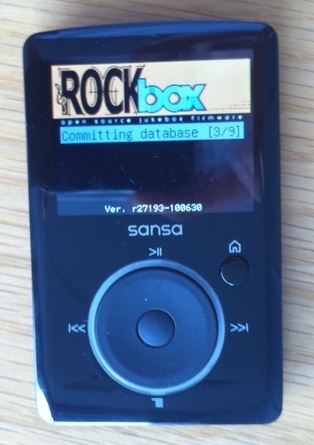 For those who are curious: yes, a Sandisk 32G microsd does work in the Fuze, at least with rockbox, for playback. At the moment, rockbox cannot write to storage on the Fuze, so you need to either use the original firmware or an external reader/writer to manipulate the contents of the microsd. However, I am not sure how well the original firmware can handle the 32G. Whenever I boot it, I see a "refreshing your media" message which lasts longer than my patience. I will write an update once I've established further the degree of support. I now have a 40G player running rockbox exactly as I had before, albeit at a fraction of the size and weight (and cost: approximately half as expensive), and with a nicer display including colours, album art, etc. They both can even play doom (although the controls are even more awkward than iPhone Doom).